I do not cast spells for people. 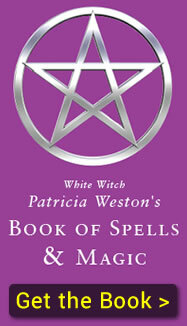 My book White Witch Patricia Weston's Book of Spells & Magic, which is available from this website, provides all the information you will need to cast for yourself. As a matter of policy, I reserve the right to refuse service for any reason. I do not read for persons under 18 years of age. I will not give advice in areas that I am not qualified. If the client needs a physician, psychologist, lawyer or other professional for which I am not qualified, I will encourage them to seek such services from a person qualified in that area. The purpose of a reading is to empower and hold space for healing. I will read to the best of my ability and I will conduct the reading with openness, honesty and integrity. If you would like to book a session with me in Skerries, Dublin please contact me by telephone on 087-6846024. I do not take bookings by text, email or Facebook message. If you are not completely satisfied with your order I can offer either a refund or exchange providing that goods are returned to us unopened, in their original condition within 7 days of purchase. Please contact me before making any return for specific return instructions. Please note that shipping, handling and sales tax charges are not refundable on returns. €5.50 per order worldwide. Packages may be subject to port taxes extra to this which will be the responsibility of the purchaser and payable to local customs. I aim to ship your order to arrive within 5 business days. If an item is out of stock, I will contact you to inform you of the delay. You may decide to cancel your order at this time and a full refund will be issued. We collect, for the purpose of shipping only, your name, address, email, and telephone number. These details are never shared with any third party. All information is submitted in the strictest of confidence. We do not send out marketing emails or newsletters. All payments are made securely through PayPal – Visa, Mastercard, American Express and Laser/Debit Cards are all accepted. Paypal is the worlds leading online payment system and all transaction are secure. I do not store any credit card information. You will be able to track your order by logging into your account and will receive a confirmation email from us when your order is shipped.